Does Slouching Affect Riding a Stationary Bike? 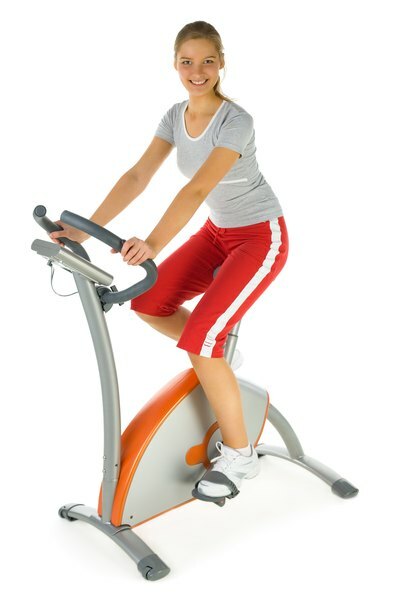 Get the most out of your stationary bike workout by maintaining the right posture while sitting. It's easy to get into the habit of slouching, particularly if you work out when you're exhausted or if you struggle with muscle pain. To get the most out of your stationary bike workout, though, you'll need to practice good posture, which ensures proper breathing and prevents you from straining your muscles. The U.S. Centers for Disease Control and Prevention report that improved mental health, better sleep and a lower risk of depression are benefits of exercise. Exercising on your stationary bike can help you gain a temporary endorphin rush and regular use could even boost your mood on a long-term basis. If you slouch, though, you could compromise these benefits. A 2012 study published in the journal "Biofeedback" found that people reported less energy and greater feelings of depression after they adopted a slouched posture. When you slouch, you add unnecessary stress to your back and this can make working out on your exercise bike painful. You can also alter the way your muscles work. Slouching to one side, for example, may force you to work one leg more than the other or it could cause muscle imbalances. Over time, a hunched posture could cause painful muscle knots and even increase your risk of cycling injuries. You probably know that you breathe more effectively if you engage your abdominal muscles correctly. But when you slouch, your diaphragm is compressed, making it more difficult for it to function correctly. This leads to shallower, chest-based breathing, which decreases oxygen supply to your body. 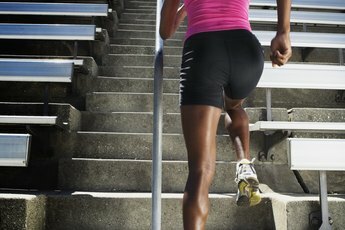 Without sufficient oxygen, your workout will be less effective and you'll get tired more quickly. You may even feel dizzy or nauseous. The right cycling posture will protect your back and neck. Keep your spine straight and avoid bending your neck to look down. Instead, keep your neck straight with your head up and your gaze directed in front of you. Your shoulders should be back, but avoid pushing them so far back that you arch your back. Keep your weight evenly distributed, rather than leaning your body to one side or using more force with one leg than the other. A few basic exercises can help you improve your posture. Try sitting up straight, elbows bent, while pushing your shoulders together and pointing your palms toward the floor. While keeping your elbows against your ribs, move your hands in a circular motion. Complete four sets of 20 reps. Next, sit at the edge of a chair with your feet flat on the ground. Slowly stand while keeping your spine and neck straight and then return to a sitting position. Aim for three sets of 10 reps. 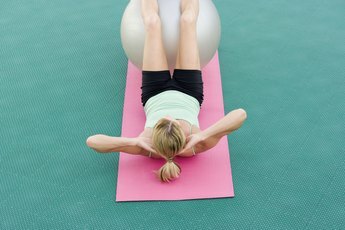 Does Your Stomach Hurt When First Doing Ab Exercises? What Does Bicycling Work Out on Your Stomach? Do Rowers Work Well for Shaping the Body & Losing Weight?